"Tetris With The Nintendo Touch! Nintendo takes on a timeless puzzle blockbuster! Every mode features a Nintendo character theme! Play modes based on all-time favorites like Mario, Link, Donkey Kong, and Samus! Tons of new ways to play! 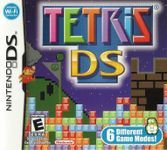 Feed your Tetris need with size crazy-fun game modes including Standard, Mission, Touch, and more. Wireless and Wi-Fi multiplayer! Up to ten players can clash over local multiplayer using just one Game Card or go on online with Nintendo Wi-Fi Connection and test your skills against opponents worldwide!"